Rangemaster have combined traditional style with modern features to create this wonderful 100cm wide Classic Deluxe cooker. The handy multifunction oven and glide out grill are perfect for busy homes, and the secondary oven provides extra cooking options, whether you need to cook pizza, bake a cake or roast potatoes! With a two year warranty as standard and an A/A energy rating you can cook away with peace of mind. The contemporary styling of the Nexus dual fuel range cooker from Rangemaster really makes people sit up and take notice. Not only is it visually stunning, with its sleek lines and white and chrome finish, but it will make cooking a pleasure no matter what the occasion. With two electric ovens, one multifunction and one fanned, a five burner gas hob and a separate grill, you can cook up a storm. 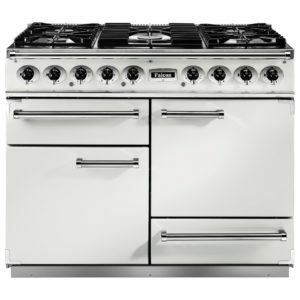 There's a lot to like about this amazing 110cm wide Colour Boutique range cooker from Stoves, finished in Icy Brook White, with its great capacity ovens and 6 burner gas hob top. In fact the hob top is going to be something you want to show off with its modern glass finish and Power Wok Plus for intense heat. The brilliant multifunction main oven has 13 functions available including fan, conventional and even a pizza setting! When you aren't able to get to the oven you can always check remotely using the clever Zeus bluetooth connectivity feature. 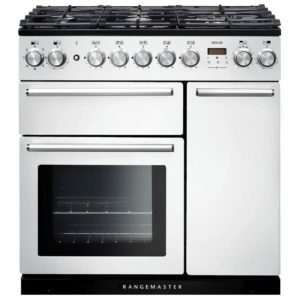 This attractive 90cm wide range style cooker from Rangemaster features electric ovens and a five zone ceramic hob. Finished in white it will create a stunning focal point in your kitchen. The energy efficiency rating on this model is A/A and it comes with a two year parts and labour warranty as standard. This fantastic 100cm wide range cooker from Bertazzoni features two spacious ovens and a separate grill compartment, so you can even fit in the Sunday roast with ease! 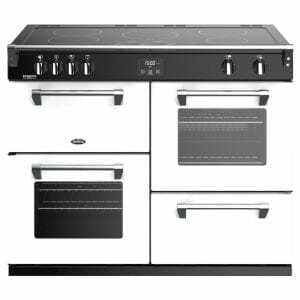 There's a six burner gas hob top with sturdy cast iron pan supports, just one of the quality touches, much like the soft close doors, food probe and rotisserie options. Finished in clean and crisp white it will create a stunning focal point in your kitchen. We love the Falcon 1092 Deluxe Dual Fuel Range Cooker, which offers the ultimate flexibility with its multifunction main oven, secondary fan oven and a separate heavy duty roll out grill. Great for the family dinners or llight lunches! 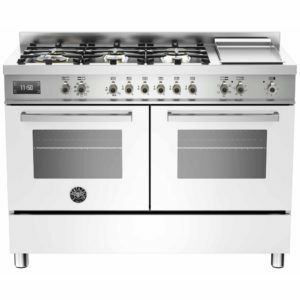 The five burner gas hob features a stainless steel hotplate offering great performance and easy maintenance. This model also looks superb finished in white with nickel trim. You're sure to impress your guests with this outstanding white 110cm wide range cooker from Bertazzoni, and not just because of its stellar appearance! You will be able to cook up some incredible dishes thanks to the plethora of features it offers, including two spacious ovens offering a great range of functions, and a clever induction hob top. So whether you are creating the Sunday roast, whipping up a family lunch or just creating perfectly crisp pizza, you can achieve some fantastic results. 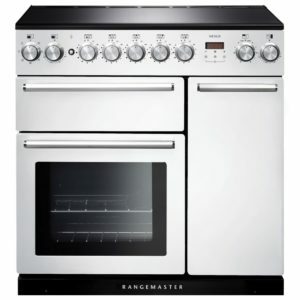 Get ready to create your favourite recipes, with this spacious and versatile range cooker from Rangemaster. Drawing on traditional design, the Classic Deluxe really turns heads with little details like the porthole door and elegant handles, and with its clean, white finish it is incredibly striking. Paired with the modern induction hob top, two generous ovens and glide out grill, there's no shortage of cooking features you can use to cook up a storm. There's even a Handy Rack included for easy tending of roasts, fitted to the inside of the oven door. 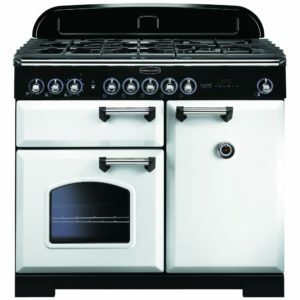 The Nexus range cooker from Rangemaster offers the perfect combination of brilliant performance with style. 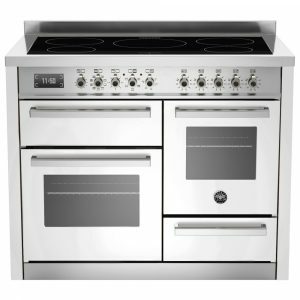 With clean lines and a crisp white finish, this 90cm wide cooker has two spacious ovens, perfect for cooking every meal from a light lunch to a roast dinner. The induction hob has 5 cooking zones, which provide great power, as electromagnets only transfer heat as the pan is detected, which means quicker boiling and better control. Look out for the easy clean interior of the main oven, thanks to the catalytic liners which absorb and break down grease for a simple wipe down, and the useful Handy Rack, which attaches to the inside of the oven door for easy tending of food. Get ready to get creative in the kitchen with this fantastic 110cm wide Richmond Deluxe Colour Boutique range cooker from Stoves. A perfect mix of traditional range cooker design, finished in Icy Brook White, with modern cooking features such as the fantastic five zone induction hob and Zeus bluetooth connectivity allowing remote timer monitoring. Using automatic pan detection, heat is only transfered from the hob top to the pan base when it is detected, making the hob efficient and powerful. Great capacity multifunction and fanned ovens offer plenty of space for all your cooking creations, and we love the dedicated slow cooker, perfect for cosy winter meals. With the separate grill compartment, Pro Trac double extension telescopic runners and innovative Steam and Infuse cooking system, which uses steam to cook healthy and tasty food, there's no shortage of options available! 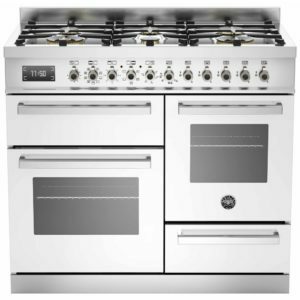 This fantastic 120cm wide range cooker from Bertazzoni features electric ovens and a six burner gas hob with stainless steel electric griddle. So whether you need to create a light lunch or a feast it has you covered! With a sleek white finish and stainless steel accents it looks amazing as well. The energy efficiency rating on this model is A/A and it comes with a two year parts and labour warranty as standard. 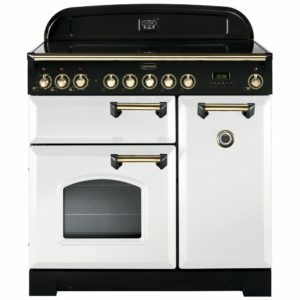 We stock four different types of range cooker if you want to narrow down your search: ceramic, dual fuel, gas and induction. Not only do we have diversity in cooker types, but we also stock range cookers from a wide variety of brands to make sure all your needs have been met. 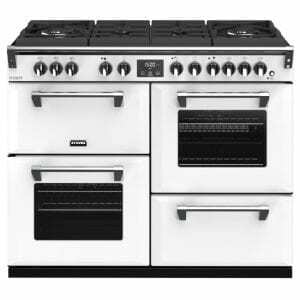 In our cooking section, you’ll find selections of built in ovens, hobs and microwaves as well. Don’t stop there, take a look at the matching cooker hoods we have in our extraction section. We also have a gorgeous range of American-Style fridge freezers in our refrigeration section if you’re revamping the whole kitchen. Save money when you buy online today at Appliance City! We break down the differences between two popular cooking appliances: the range cooker and built in oven. What you need to do before and during installation. How much do Range Cookers cost to run? Find out how much your range cooker will cost to run. Keep your range cooker looking its very best. Choose the right type of range cooker for your home. And why should you choose one for your home?